When Mrs Josephine Low decided it was time for the childcare group of which she is a director to grow from a small to a medium-sized enterprise (SME), she realised there were gaps in her business knowledge. The director of corporate operational development at Sunflower Childcare Group wanted to pick up skills such as strategy planning and crisis management. Said the 46-year-old: "Most SMEs don't really plan ahead. It's a lot of firefighting." She was among 12 managers and directors from SMEs who attended a new leadership course by Nanyang Business School (NBS) at the Nanyang Technological University (NTU) last week. The course is the first for which the Singapore Workforce Development Agency (WDA) has roped in NTU to train SME chiefs. 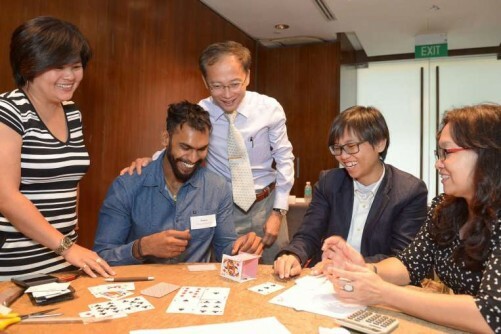 NBS strategy lecturer Clive Choo, who helmed last week's class, introduced team exercises such as building prototypes for imaginary build-to-order tenders out of a deck of playing cards. This, he said, was to get participants to cooperate in pooling limited resources, which are often what SMEs have to work with. The course, which is in line with the national SkillsFuture movement, is capped at about 15 people per cohort. It comprises three modules taught a few weeks apart, the first of which ranlast week. The modules cover subjects ranging from competitive business strategy to supply chain management. Emphasis is put on a final project in which participants apply learning points from the course to solve problems in their firms, like cutting turnover or lowering production costs. WDA enterprise programmes director Doris Kuek said global studies such as the World Management Survey found that Singapore SMEs lag behind in leadership and management. The Association of Small and Medium Enterprises (Asme) president Kurt Wee said continual learning courses in these areas are vital for employers. "There are a lot of factors involved beyond just running a small business - the capital market, risk and change management, how to design a good remuneration structure. "These are critical and bosses should keep upgrading themselves," said Mr Wee. Participant Prem Roy, who heads a car dealership, said that he was drawn to the course by the subsidised fees. Participants from eligible SMEs can get a 70 per cent fee subsidy from WDA - which amounts to more than $5,500 - and also tap initiatives such as the Productivity and Innovation Credit Scheme. Mr Roy, 30, said: "This has been an awakening. I'm going to go talk to my staff, see the areas where we are falling behind in and improve our business processes."